Beneteau Oceanis 38 takes cruising to a new level. High performance, open space and new organization options are few of its unique features. The exterior of this yacht is designed to have increased stability and high-speed performance. When it comes to interior, the choices are unlimited. Creative options are available to mix and match wood finishes, lighting and upholstery. It is really a retreat when it comes to this yacht. Here you see the image where we provided one of our most popular, 9” pillow top latex mattress, to this client. If you love a plush mattress, then our Admiral is for you. We construct this mattress with a super comfy 6” (medium) Latex core and then add 2” of ultra-soft latex Pillow Top and cover it in the plushest of bamboo quilting. The result can truly be compared with a 5-star hotel bed. We specialize in latex. The reason is because of its amazing benefits especially for a marine environment. Latex is mold and mildew resistant, extremely comfortable, helps regulate body heat, which allows you to sleep cooler, and it will not absorb smells. At the same time, I would like my readers to remember that we make everything custom and can make any material, shape or size for your particular boat. Each boat mattress is crafted to fit the unique size and shape of your berth. Each boat mattress we make is crafted custom in California and built to stand up to rigors of a marine environment. With several boat mattress and mattress topper options to choose from, we are able to create a sleeping solution to fit all budgets. Browse our website to look at all our other options of mattresses and toppers and feel free to contact us if you have any questions. If you notice the image here, this 9” pillow top latex mattress is made with a hinge. Hinging is a great option when you have storage underneath the mattress, or want to be able to fold it in half for easy removal from the platform all together. And No, you won’t feel the hinge. We make sure the quilted covers pull the two pieces together to create a smooth surface. 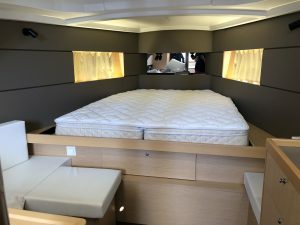 With Yachtbedding.com, getting a great night sleep on your boat has never been easier. 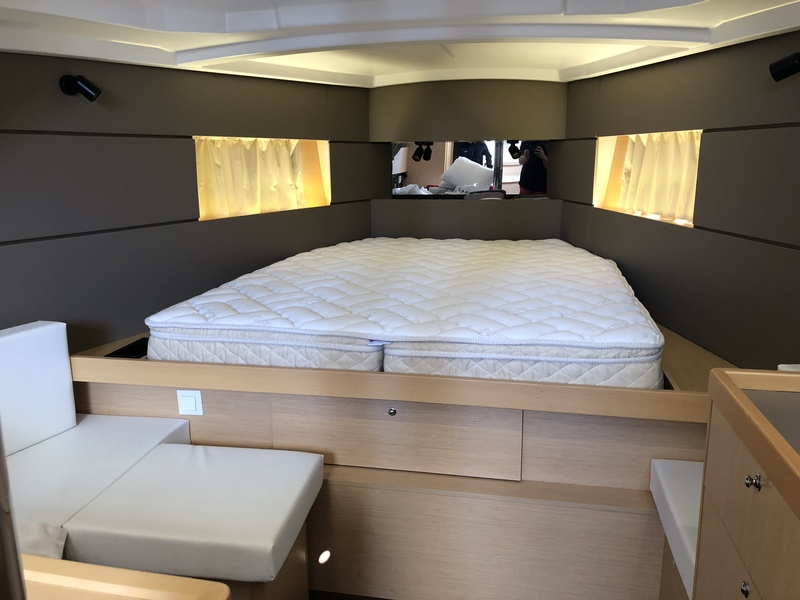 Our team is always available to give you ideas and help you design a comfortable bed so your nights are as comfortable as your days on your yacht.